Updated July 2017 with new links. Some of these pens have unfortunately been discontinued. Updated November 2017 with Amazon affiliate links at the bottom of the post. What’s a stationery blog without pens? Here are some of the black gel pens I’ve discovered over the years and my thoughts on them. I’ve never done an in-depth review on any specific pens before, and I don’t claim this to be one. This is just a way to organize my thoughts on my gel pen journey so far. Let’s start with the negatives. Gel pens I will probably not buy again. 1. Pilot Hi-Tec-C (0.25 to 0.4): Man, I really don’t remember what pens I used before Hi-Tec-Cs. That was a long time ago. I thought they were great at first, and it took me awhile to realize they’re not for me and that there are other options out there. As soon as I found Zebra Sarasa (see #6), I never looked back. I just find it uncomfortable in my hand, especially, the grip area, and the ink flow frustrated me often, especially at the start of writing. I will never choose Hi-Tec-Cs for my daily writing but I do look out for any special colors they release, like the Yawaragi colors, just for the fun of it. Side note: I tested a Hi-Tec-C Maica in brown recently and was pleasantly surprised. Okay, never say never. 2. Muji Hexagonal Polycarbonate Gel Ink Pen (0.38): It writes well but it's nothing too special. I got it because of its hexagonal body. Feels kinda cheap. 3. Muji Polycarbonate Gel Ink Pen in round body (0.38): Similar to the hexagonal one, nothing special. Maybe I just don’t like how the polycarbonate looks and feels. Meh. Edit (July 2017): this pen has apparently been discontinued. 4. Muji Gel Ink Pen in round body, refillable with cap (0.38): I thought this was great when I tested it at the store but when I actually used it for an extended period of time, I realized it’s not for me. The top tip of this pen is a small plastic part that seals the refill in, and it becomes unscrewed over time, if you post the cap. Annoying! Otherwise, I’d prefer this over the two previous Muji pens. 5. Uni-ball Uni Style Fit: M and I actually discovered this pen while on a trip to Tokyo! It looks great and writes well but over time, we realized it’s too slim. And, naturally, the ink reservoir is tiny. I think Style Fit is how we found Jetpens because we were looking for refills for it. Ha! Anyway, we’ve moved on. I’ve tried the multi-pen body with different types of refills too but I wasn’t blown away. I like that they release special designs in collaboration with other brands though, like with Majolica Majorca. I have tons of those. Oops. Now, onto the positives. 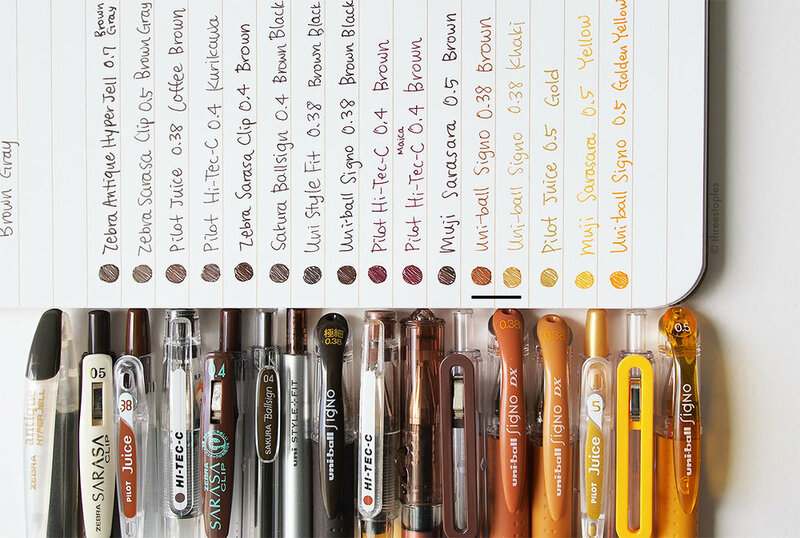 If I reached for a pen in my pen cup and grabbed any of the aforementioned pens, I’d put it right back and look for any of the pens below. Struggle’s real. 6. Zebra Sarasa Clip (0.3 and 0.4): As mentioned before, this is the pen that replaced Hi-Tec-Cs in my life. Cheaper, better grip, better ink flow. I’ve gone through countless numbers of refills for these, for both work and personal use. 7. Uni-ball Signo RT UM-138 (0.38): This sort of replaced the Zebra Sarasa for me, except my local stationery stores never seem to restock them (this was before I shopped for pens online). Retractable, sturdy grip, great ink flow. I think the Signo fits my hand slightly better than Sarasa. 8. Muji Gel Ink Pen in colored hexagonal body (0.3 and 0.4): What a handsome pen. I love its design. And it’s smart. There’s a slim window at the bottom as an indicator of the ink level. The whole body is grippy and it’s hexagonal! I think I have a thing for hexagons. This was in heavy rotation until I discovered Pentel EnerGel Euro (see #10). Edit (July 2017): this pen is now available only in 0.25mm. 9. Uni-ball Signo RT1 UMN-155 (0.38): A recent discovery. I tried it because it looks like a fancier version of the other Signo RT. It certainly looks great and writes smoothly. Might be a tad too thick for my hand, and my fingers tend to slip down over time but I still really like it. 10. Pentel EnerGel Euro (0.35): My current #1 gel pen. This writes like buttah and feels SOLID. I truly love how it writes. It’s almost like a holy grail pen for me. Except, it lacks in the looks department. Why on Earth is it BLUE?? WHY?!? *sobs uncontrollably* It really would be my holy grail gel pen if it had a black body without those stupid slits on the cap and were refillable. Maybe it’s so solid because it’s not refillable? Still, I would flip some serious tables if this pen ever got discontinued. Gel ink pens are what I use probably 80% of the time. They’re all I use on my Field Notes. I do own and use other types of pens but they’re more purpose-specific. And I’m a big fan of black ink! This was all about black gel pens because colored pens probably deserve a separate post. Occasionally, I seek dark, non-black colors, like muted brown or gray but never blue black. Nothing personally against the color blue, I just don't prefer it for my own writing. Hence, my lament on the unfortunate color of Pentel EnerGel Euro’s body. Hm, I’m sure I left out some pens here and there but I’m also sure this won't be the last time I write about gel pens. As I was searching for links to add, I found even more pens I’d like to try. So much to keep up with! :) What are your current favorite black gel pens? These may not be the best deals, but in case you prefer to shop at Amazon, here are some product links related to this post. These are affiliate links, which means, if you follow these links and make a purchase, I'll earn a tiny commission. Every little bit will help support the hosting of this site, and I’d very much appreciate it.